Master PDF Editor is a simple and convenient program for working with PDF documents, equipped with powerful and rich functionality. With the Master PDF Editor you can view, create and easily make changes to PDF documents. The program allows you to combine several files into one and split the source file into several documents, comment, encrypt, sign and print PDF files. With the help of Master PDF Editor you can add text with any formatting to the document, as well as edit the existing one. You can also paste any images into the document, select and drag objects in the PDF file, resize them, save the images to a file or copy to the clipboard. With Master PDF Editor, editing and filling in interactive PDF forms of various types such as text fields, buttons, lists, digital signatures, etc. becomes simple and convenient. Supports automatic calculation and validation of data using javas--cript. OCR allows you to quickly and accurately make text available for selection, search and editing in scanned documents or documents with images. 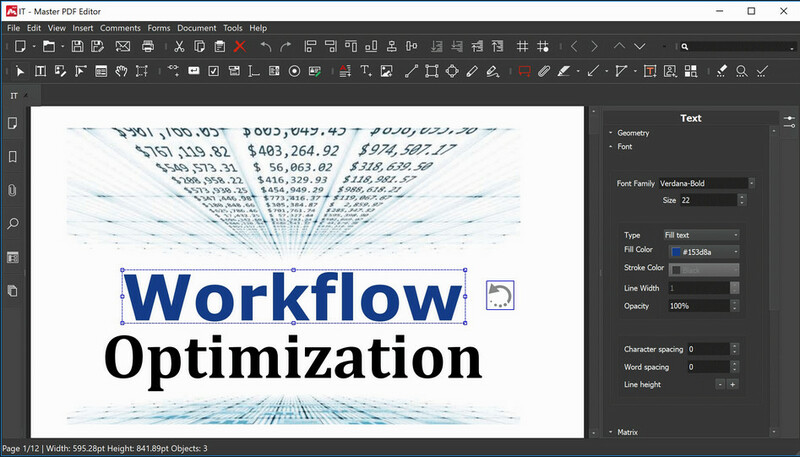 Master PDF Editor allows you to merge and split PDF files. Using the capabilities of the program, you can simply and quickly move, delete, and rotate the pages of the document, resize them. In Master PDF Editor you can create, edit or delete bookmarks. Add bookmarks to specific pages or sections to create quick navigation through the document and quickly find the information you need. Master PDF Editor is installed as a virtual PDF printer, and you can easily print any documents from various applications that support printing (for example, Microsoft Word and Excel or Google Chrome). The PDF virtual printer is included only in the Windows version. With Master PDF Editor you can verify digital signatures, create new ones and sign documents with a digital certificate. A PDF signature is an electronic equivalent of a handwritten signature on paper documents, so the recipient of a signed PDF document will be confident in its authenticity. PDF can be created directly from a paper document using a scanner. Master PDF Editor allows you to create documents from existing files, as well as create empty documents or blank pages for posting additional information. Fixed critical bug which caused application to crash on specific PDF files.